Note: The programs above began as macros but now can now be installed directly as Ribbon bar "add-ins". wiki.ActivityOwner.Com is the companion site for the ActivityOwner.Com blog; hosting software, libraries, and resources that readers can contribute to. Search this site and activityowner.com using the Custom Search Page. Many of the add-ins on the site build upon MindManager, ResultsManager, and GyroQ to assist you in implementing streamlined and efficient personal management principles. They attempt to practically apply the Getting Things Done (GTD) insights to a computer-based environment. If you find the information or tools on the site useful, consider visiting the Donation page. Where to Start? The overall system of using MindManager, ResultsManager, GyroQ, MindReader, OutLinker, and other tools on the site can be daunting. For quick reference, visit the "What do I do when I..." to see how to get what you need done. 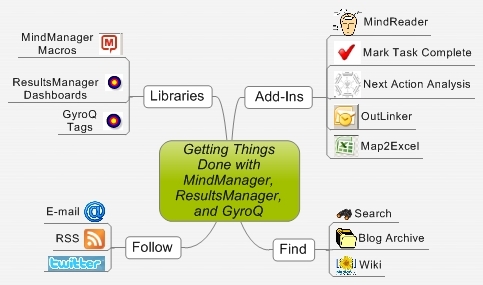 NOTE: MindManager 9 introduced changes in the way that task dates are handled that disrupt the way MindReader and ResultsManager interact with maps. The MindManager 9 Issues page enumerates the current issues. Several can be addressed by going through MindManager Setup Tips. This wiki also provides information on developing custom GyroQ tags, MindManager Macros, and ResultsManager dashboards in MindManager for implementing and GTD. This page was last modified on 21 September 2013, at 09:35. This page has been accessed 547,206 times.